Over the last week I have noticed poppies sprouting up on lapels and jacket collars. I think that all of us at Ryerson should be wearing a poppy this week, in the days leading up to Remembrance Day on Sunday. The poppy, a symbol of remembrance, is our visual pledge as Canadians to never forget those who have fallen in war and military operations. The significance between the poppy and war dates back to the Napoleonic wars in the 19th century, more than 110 years before it was adopted as a symbol of remembrance here in Canada. A record exists from that time of how thickly the flower grew over the graves of soldiers in Flanders, France. In the First World War, during the Battle of Ypres in 1915, Lieutenant-Colonel John McCrae, a Canadian Medical Officer, wrote the poem In Flanders Fields on sighting the poppies growing next to a grave of a close friend that had died in battle. 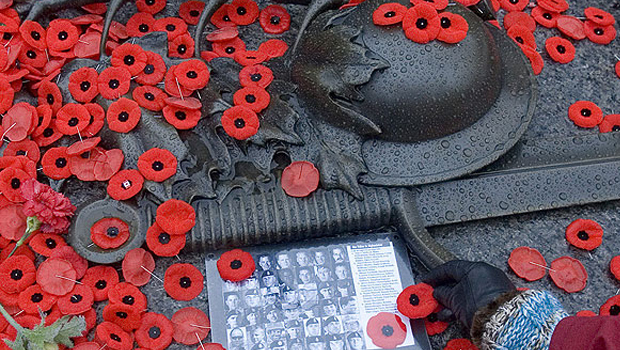 Students across the country are taught the poem every November as it is read aloud at public gatherings and Remembrance Day ceremonies. On November 11, on the 11th hour of the 11th day of the 11th month, Canadians are asked to pause in silence for two minutes, as a tribute to the thousands of men and women who paid the ultimate sacrifice and died for our freedom. The day marks the anniversary of the armistice to end the First World War which came into effect at 11 a.m. on November 11, 1918. For the last few years I have had the honour of participating in my hometown’s Remembrance Day ceremony. A service club I volunteer with makes a donation to the Royal Canadian Legion on Remembrance Day and every year I am asked to place a wreath on our war memorial cenotaph on behalf of our club. The ceremony is always very humbling, with many local shoppers and businesspeople taking a moment to stop what they are doing and gather to remember. The two minutes of silence is a significant part of the ceremony when everyone bows their head to remember fallen soldiers. I always take this time of reflection to look at the veterans standing in front of me, and, every year, I am astounded by the ultimate bravery and courage these people faced. I never had any grandparents or close family members that fought in wars, and I never grew up hearing stories like the ones I hear from veterans on Remembrance Day. The stories of bloodshed and battle bring real meaning when they are standing in their uniform with war medals dangling from their chests and a poppy fastened over their hearts. While I stand in silence and try and think about what it is like to be a solider during World War II or in Korea or Afghanistan, I am reminded that the veterans at these ceremonies do not have to imagine because they lived through these wars. For them, the two minutes of silence means thinking of fallen comrades, evoking memories and remembering those who did not return home. I am reminded that we are very privileged as Canadians because we never have to experience the horrors of war. These wars were fought to preserve a way of life, of Canadian values, and of freedoms we enjoy today that so many of us often take for granted. So don’t forget to wear a poppy this Remembrance Day. Proceeds from poppy donations support the Royal Canadian Legion’s efforts to help veterans and their families with needs such as medical care, shelter and clothing. If your poppy falls off (which often happens, I’ve lost three in the past few days) try sticking a Canadian flag pin in the middle or using the backing of an earring to keep it in place. I hope that you will take time on Remembrance Day to attend a ceremony, happening across Canada this upcoming Sunday November 11. Previous Article10 Things I Won’t Ever UnderstandNext ArticleGirl, You’re Breaking My Heart.